Living in New Mexico means hoping for rain. The state is in drought, with most areas officially in either “extreme” or “exceptional” drought. The soil is full of life waiting for a chance to express itself, but the rare rain forecasts usually promise only “scattered showers nearby,” with the outcome being either clear blue skies or the sight of rain falling elsewhere. New Mexico is, as well, one of the poorest states in the U.S., with more than one in five New Mexicans, and one in four children, living in poverty. We are second in the nation for the prevalence of youth living without connection to work, school, or family. New Mexico ranks high (#7) for people living with serious mental and emotional challenges. 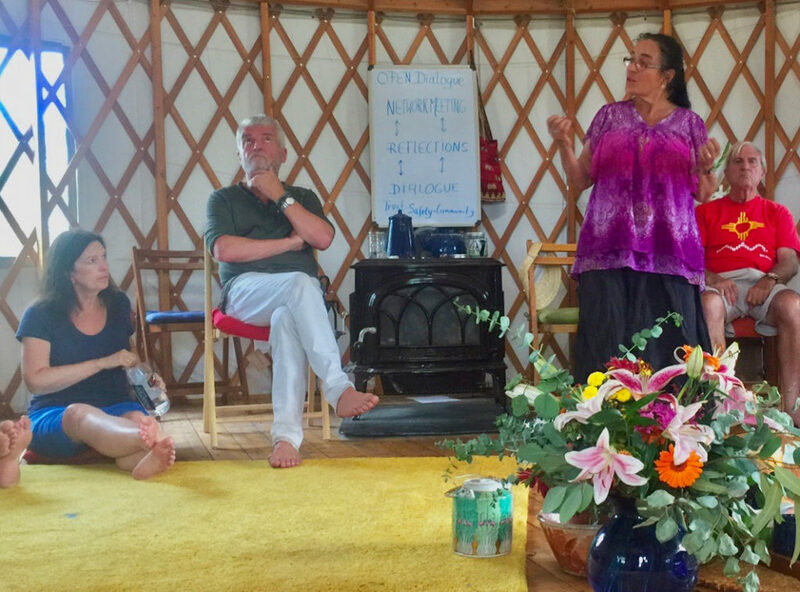 When I moved to Santa Fe from the east coast, five years ago, to live and work with my partner Louisa Putnam, we were excited to bring Open Dialogue and Hearing Voices to a state with such deep need. We had been brought together by a shared passion to find better ways to respond to distress. In our lives and work we had seen the catastrophic results of the unfulfilled promises of psychological diagnosis and biological psychiatry. This search brought us both to Bob Whitaker. We committed to supporting his work — and the groundswell it is part of — by helping Bob to start the Mad in America zine, for which I was founding editor, and with others to create the Foundation for Excellence in Mental Health Care. These organizations have made learning about and supporting Open Dialogue and Hearing Voices a cornerstone of their missions. 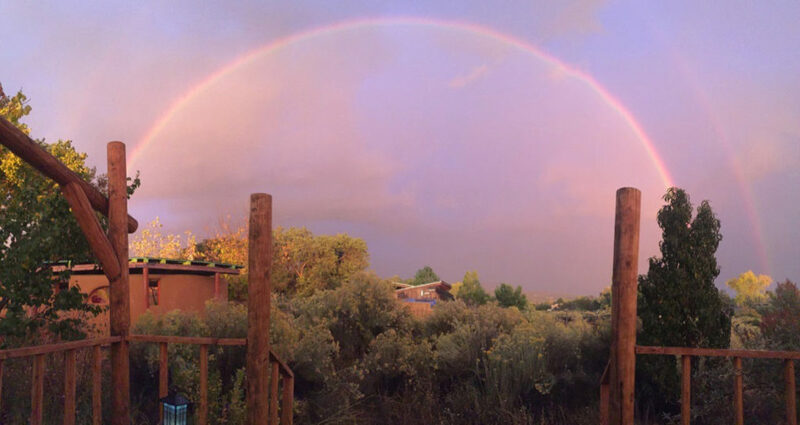 Louisa and I longed to do the work inspired by these approaches, and bring them to New Mexico. Louisa has pursued a path that led to Native American ceremony, including vision quests in the desert, without food or water, and becoming a “pipe carrier” — one who is asked to respond to people in need. 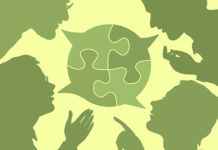 We were thus very conscious of the fact that much of what is good about Open Dialogue and Hearing Voices has in fact been a part of successful communities throughout time, and especially in the southwest; listening to the voices of the earth, clouds, trees and birds, and gathering in circles to listen to people in distress and learn with them. Further, we were respectfully aware that both HV and OD exemplify ways of being that had long been present in the southwest before Europeans arrived; listening and dialoging with community members as well as the earth, sky and nature were a part of the culture that went far beyond problem solving; they were a way of knowing, a way of being. We can see more starkly now than ever that the voices of the most silent among us, including the earth and sky, are ignored at our peril. The righteous anger and disorientation of the silenced, so often called “madness,” is analogous to the global fever that threatens us all. Louisa and I hoped to help, if in a small but palpable way, other families to avoid the tragic outcomes we have seen. Inspired by Open Dialogue, we pursued post-graduate studies at America’s original school of marriage and family therapy, the Council for Relationships in Philadelphia. We are now licensed as marriage and family therapists in New Mexico, and work with many of the state’s at-risk families, sometimes helping them to see that there is an alternative. One of our first initiatives in New Mexico, in 2013, brought Ron Coleman and Karen Taylor to Santa Fe in 2013. Their presentation at the LifeLink center resulted in a Hearing Voices group, and LifeLink’s staff and therapists have been trained in the model ever since. Since, we have gathered representatives of Open Dialogue such as Werner Schutze, Mia Kurtti and Eleni Alavanti, and Hearing Voices representatives such as Olga Runciman as well as Ron and Karen for a series dialogue exploring the intersections between these two approaches. Werner Schutze and Olga Runciman exploring the intersections of Open Dialogue and Hearing Voices. The parents of a man who had been attending the LifeLink’s HV group came. Their son had not been doing well; though he attended the group, he did not speak at it. There had been incidents of violence, and the parents were in despair. The two parents took positions in the circle 120 degrees from each other, as if to sit as far from each other as possible without looking at each other directly. 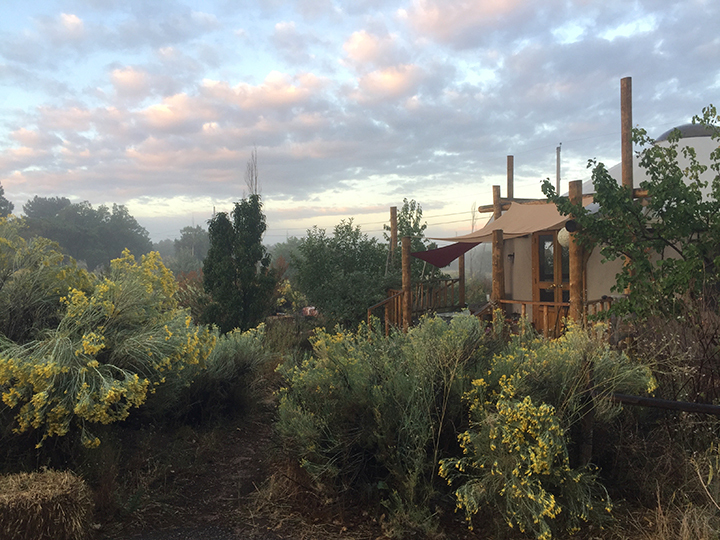 The son hovered around the property, sometimes coming to the door of the yurt, sometimes entering — gesturing about some unspoken need, then leaving when a parent got up to follow. Each time he entered, Ron welcomed him and invited him to join the circle. Eventually the son sat in the circle, taking a position 120 degrees from both his mother and father; as far as they could be from each other without having to see each other directly. Ron invited the mother and father to participate in “family sculpting,” an approach that, though it may seem radical to some, is reminiscent of some of the iconic work by Virginia Satir I had studied in Marriage and Family Therapy training. Difficult dynamics between the father and mother were exposed and explored. 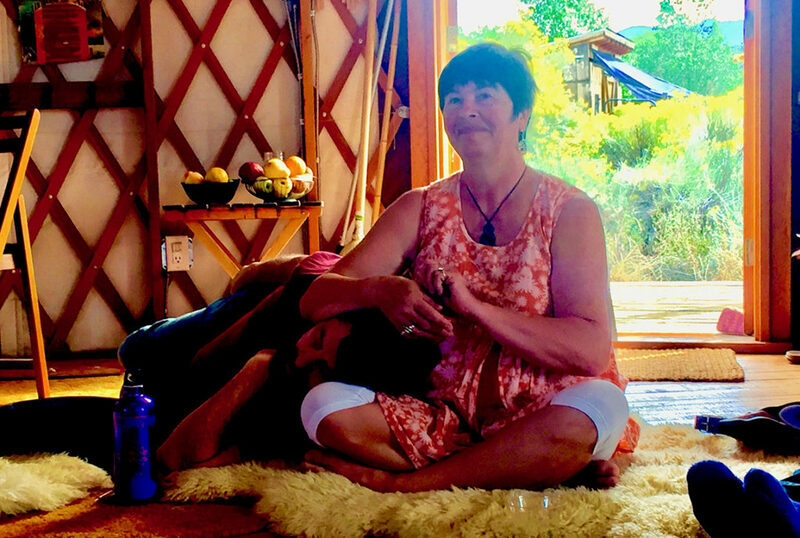 Karen Taylor at the yurt in New Mexico. Clouds gathering in the New Mexico sky above the yurt. There was an extended silence as this statement sunk in. I could feel the group draw closer to hear what came next. But the rain fell harder until all sound was drowned out, and conversation ceased. We sat together, feeling the rare rain soak into our ears, our bodies, the ground; words were unnecessary. New meaning was arising. Just listen, and the story reveals itself like new life springing from the ground. Ron spoke a simple and essential truth: that what seems like madness has roots in our histories, and the histories of everyone we’re close to, and the histories of everyone that came before us; what we’re called to do for people in crisis is listen until the story reveals itself, and begins again. We hear that the son continues to attend the HV group, and that after this experience he began speaking up in the group and is generally doing well. Ron Coleman and Karen Taylor at the family sculpting session. Louisa and I continue to build our practice in Santa Fe. One of my most satisfying experiences came when, working with a family from a native North American tribe, they suddenly remembered that talking with the earth’s and sky’s spirit voices had been — and indeed still was — a strong part of their lineage and practice. Since then they have realized that their son’s diagnosis of schizophrenia ten years ago had been a mistake. They now relate to him entirely differently and his path, which had seemed close to an inevitable early death, has become a new one. We are dedicated to creating more opportunities for people in crisis to choose the path Open Dialogue points toward. 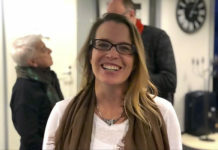 This morning, August 29, Louisa and I arrive in Tornio for the 23rd International Network Meeting for the Treatment of Psychosis, a gathering of people from around the world who are dedicated to taking inspiration from Open Dialogue’s accomplishments. Next week we will attend the second module of a two-year “Train the Trainers” program in Helsinki as well. I am deeply grateful for the philosophy this path has led me to. I have touched great beauty in this work; Open Dialogue and its related philosophies have given me a container for it, as well as a network of people I respect and with whom I feel comfortable. 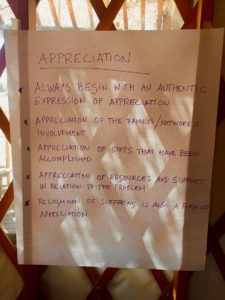 I am excited to gather this network in an upcoming series of webinars for MIA that will gather the many friends we’ve made from around the world to explore with the MIA and Foundation for Excellence communities how this philosophy has touched them, and how this practice informs their life and work. 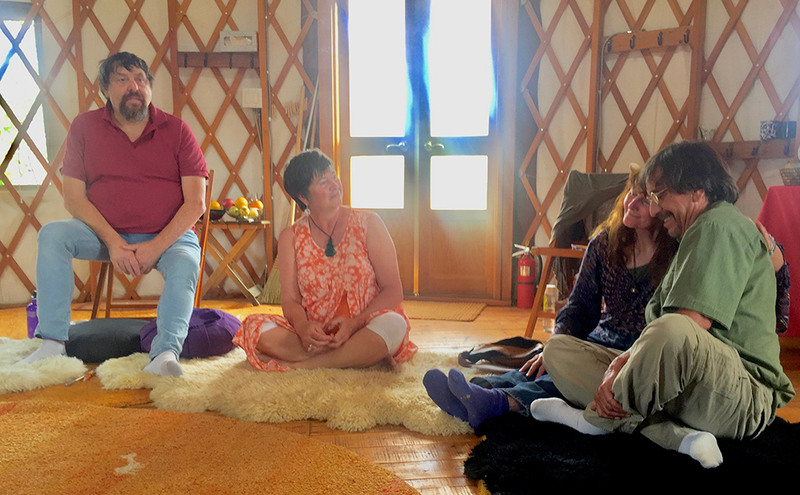 Ron and Karen will be offering another workshop in our yurt in Santa Fe this October 1-4. We encourage anyone who would like to participate in Ron’s last working trip to the U.S.
Next articleWhat Stops People From Using Exercise to Treat Depression? Thank you. For what you are doing, for the paths that you and others are blazing, and for telling this story. Thank you for your note, and for the lovely song. It is playing now as I respond to comments. Than you, Berta. Looking forward to seeing you again. What a beautiful story. It made my day! Thanks, Mary. Your tireless contributions to MIA are much appreciated. Psychiatric language is a cancer. Using words that describe meat or some kind of brain illness is a PSYCHOPATHY not empathy or psychology. Psychological language was first used by Jung, then by James Hillman, who was a genius of the ART OF SEEING AND DESCRIBING HUMAN PSYCHE. Scientists and apollonians refused to use it, I hope they will burn in hell for it, because it is a heresy and deliberately devastation and condemnation of the human psyche. PSYCHIATRY IS A MAIN KILLER OF POETRY AND IMAGINATION. Language is everything. I wonder when people will notice that fact. THE ART OF SEEING. We are all set to the challenge of meeting the paradox of being spiritual beings in physical bodies. I see this debate as being an ongoing effort to hold the multiple, seemingly irreconcilable perspectives. To remember that we see the world not as it is, but as WE are, and therefore learn about ourselves from what we see. That said, I have said, as you do, that one of the first victims of the dominant view of psychiatry as it is currently instituted is the poetry. This was not always the case, and is not the case now for many psychiatrists I know. But it is a greatly diminished profession from when it was humbler in the answers it purported. THAT said, there have always been people who claimed to have fixes for all the fears and pains we face. They tended to gather glory and fortune, usually while hurting people, while others worked quietly and without much reward; perhaps that is because that is what good work requires us to do. I think this has always been the case; we can find stories of good people doing good work in every era, and it always looked pretty much the same as it does now. I don’t think this is a fight we win; it’s a responsibility we have: to take our turn, do the best we can, and hope to leave things a little better — or none the worse — for whoever picks up the baton after. Obligating ourselves to “changing the paradigm” can have the unfortunate effect of disparaging the daily work, which isn’t always successful — but is always worth doing. I think that is the paradigm, and it is our job to help and encourage each other to keep at it; not denigrate each other for failing to change the world. Maybe I write about psychosis in Hillmans language. Normal means ego is on the apollonian level of the psyche, this is the simplest kind of imagintion that HAVE YOUR IDENTITY —YOUR EGO. In this kind of style of thinking we are convinced that psyche is sth we can control. That this is an apollonian property, it is not. This is an illusion of the poorest of the human imagination. Psychosis is different, this is psychological hades, ego lose its ground, no hope no future. You don’t know who you are anymore your identity, your ego it is not your property anymore, the jungian fullness is a myth there. And now, you know that Jung was just a childish dreamer. This is psychosis. Authoritarians has got no respect for Hades reality, because they see it only as INABILITY OF FUNCTIONING IN MATERIAL WORLD. This is a heresy of materialists. THIS IS ANTIHUMAN HERESY, BECAUSE PSYCHIATRIST should be SOMEONE WHO OUGHT TO DEFEND THE PSYCHOLOGICAL REALITY, NOT THE SIMPLE FLESH MATERIAL WORLD, – THE WORLD OF APOLLONIAN EGO. NORMALCY IS TOO SIMPLE,,,,IT HAS NOTHING IN COMMON WITH REALITY OF THE PSYCHOSIS. Authorotarians, exorcists and the others antipsychological charlatans are not enough human even to kiss Annelise Michel feet. You are convinced that your poor empty medicine world is sth which can compete with the greatness of the human psyche, with Hades reality.. Always think about Anneliese as of the genius of the descent. The ghostlike beauty of the psyche, the psyche is sth real, authoritarians. Psychosis IS STH REAL, PSYCHE IS STH REAL. This is not theology, this is psychology. I like to focus on the miracle that we ever achieve clarity, and that we experience the joy of sharing it. Thanks, Eric. Means a lot, coming from you; a writer of great power and depth. Maybe what is within us is close to what is between us. I’ve also thought of it as “I think, therefore I wonder (or worry about) what you are thinking.” As alarming as it can be to realize that our understanding of the world is so interdependent with others’, it is also elevating, even transcendent, if we can get over the fears (and hurts) that arise in the points of connection. So beautiful to see this kind of thing. At a forum for abuse survivors I suggested love–not psych “remedies”–were what depressed and traumatized people need. It was awkward since they didn’t want to seem mean. (Who wants to deny battered “mentally ill” wives love?) But they KNEW psychiatric drugs worked and the chemical imbalance was an undeniable proven scientific fact. I got irritated and left the forum. But not before posting a link to Dr. Pies’s article about the harmless “metaphor” well informed psychiatrists like to use. Well, some difficulty can arise with the word “love”. For many it’s a scary word; it’s been used as a threat, as an accusation, as a cover. For some it’s anything but positive or even neutral. Not to mention that it’s a threat to some peoples’ livelihood. I try to avoid it. I think about “clarity,” because I believe that if we look to the point of connection with others, we can (strive to) find clarity there, and when we do we will experience the things we call “love” and “goodness.” I know this seems like an act of faith, and I guess it is, but I believe it is true; when we look deeply enough into another person, we find what we hope to find eventually; but it’s been covered up by years of traumas and adaptations. Louisa is my main teacher in this; the harder it is to find the good in someone, the more she’ll keep looking. (For many this may help to explain her attachment to me.) Only once or a notable twice have I seen her give into exasperation. Thank you, Duane. This means a lot. I was born in New Mexico and am of First Nations background although I’m not from any of the tribes found in New Mexico. My grandmother was a Wise Woman who used plants and herbs to heal. I remember as a small child watching her in the garden jungle that she spent years creating in the arid section of the country between Albuquerque and Gallup, not far from Mt. Taylor, and having humming birds land on the palms of her outstretched and uplifted hands. It was nothing short of miraculous. And then she became “ill” and the mental health system got its hand on her. After almost sixty shock treatments she was returned to us as a shell of her former self. She didn’t even remember me, her first grandson whom she took care of in my infancy and early childhood. They took a vibrant and talented woman who created art and healed people and animals and turned her into a zombie who looked at the floor and smoked cigarettes one after another. The stupid doctors congratulated themselves and told us how much better she was after their good “treatment”. So, thank you for what you are doing in New Mexico. Perhaps it will work to counteract all of the horrible things that have been done to people in that area in the name of “good mental health” treatment. I believe that true healing and well being can be found in the old ways that were once practiced there by the native peoples and by people like my grandmother. Kermit, thank you for sharing this profound wisdom and experiences. It moved me to tears. How Nature and open hearts can mesh together, bringing silence and a sense of liberation and deep acceptance. I’ve had OD therapy in the UK for two years now. Reading Jung, listening to my voices and accepting my visions as real and meaningful meant that I was never, ever going to share my distress (not mental illness) with someone who wanted to medicate me. Russell Razzaque’s book “Breaking down is waking up” made so much sense. To be listened to, have spiritual and ancient ancestors accepted in therapy, to have a team mirroring my feelings in their feedback is like bathing in light. No water is needed, just light. I experienced the judgement of two mental health ‘professionals’ at an OD conference in London last year after I spoke of my experience at a patient, and that therapy is, in fact, soul work. And that we all have souls, whether we choose to recognise it not. Their bombastic comments made me feel quite ill, but I was able to rebut them, and informed one that while he may see me as “mentally ill”, I was in fact spiritually well. All I ever wanted to be! It left him open mouthed! Our ancestors knew what was needed: connection to the earth each day, families and people around us who accept and love us as we are, rather than judge us and enough work to use our skills and be of service, without exhaustion. In my heart, I hold a profound gratitude for all indigenous peoples – wisdom workers. Thank you! I take as a matter of “faith” that “therapy is, in fact, soul work. And that we all have souls, whether we choose to recognise it not.” How I relate to that, though, is that I automatically translate in my head whatever words someone is using into something that I hold as universal; that we are all trying to organize the light; make sense of the world. We are all allies in the war against entropy. At the most superficial level only, we seem separated by what we hold to be “true”; the more profound reality is that we are ALL intrinsically dependent on each other to make sense of the world at all. Even someone who seems diametrically opposed to our way of seeing things is only showing us what our common object of interest looks like from the other side. That is how we get a three-dimensional picture of the world. In that sense we benefit from all the eyes there are in the world, or have ever been. We might call the space from which that arises “soul,” or “truth,” or “knowledge,” or “psyche,” depending on whether we are coming from religion, or philosophy, or science, or psychology. But whatever lens we are using, if we are using it with humility, we can experience awe. I don’t feel the need to quibble about which language anyone is using. Yes, Kermit, language is very restricting! Well, I’d add that language is what it is; a way to connect, and a way to differentiate one thing from another. That means that language can also have the effect of highlighting how difficult connection can be, and when it fails. It also can mean that when we differentiate one thing from another, for instance by saying “that is a rock, and that is a mountain,” we are NOT saying that a very large rock can be a mountain, or to an ant a rock can be a mountain,” etc, or that when we say “that is a rock, and that is water,” we are omitting that on Pluto water would be considered a rock, and on Venus many things we call rocks would flow like water. My point is; what we “know” of the world we know through language, and language makes the world what we know of it. It is both very useful, and a bit dangerous to believe that calling something a name makes it so. The fact that people suffer is real; calling it a name as if we know what that suffering is and what to do about it is tempting but dangerous. But having the conversation is good. It just get dangerous when we are tempted to bring the conversation to a close by trying to “know” something definitive. I think life is an ongoing dialogue. It’s dangerous to hope for the conversation to end. Yes, Open Dialogue does point toward the example of a particular circumstance of a particular philosophy being implemented system-wide. In that sense it is an inspiration for what is possible, and poignant (or worse) for those who cannot access it. But the fact that it is not available in exactly that form is not the end of the story; we can take the inspiration, and the philosophy, and implement it, if not to replace what’s available in our networks, then at least to make sure it is available to people who need it at the right time. We will never eliminate the dominant biological model of psychiatry we live with. In fact, they haven’t in Finland. But the fact that Open Dialogue is available has crept into their community to such a depth that school counselors, for instance, call family and network meetings for episodes for which we would send a child in America to the hospital. I like to think that the way to think of it is to work with the network you have access to, if not the one you might wish to. If you can’t change the whole system in your community, you might be able to work with a family to help them see that a different response to their members’ distress is possible. This is not a challenge that should be underestimated when people are confused and frightened; I think we should forgive ourselves and others for not being at their best at those times; that is where the work STARTS. If we can’t work with a family, maybe we just work with a person and their most significant others. Or just with the person. And where we can’t get a person to do the work, maybe we just work with ourselves to remember that nobody is just themselves; they are everyone they care about, and everyone that cares about them, and in an important way they are everyone who has ever lived. The Open Dialogue inspiration can bring significance results, and an entirely different path to follow, when we let go of trying to recreate it like it’s some kind of miracle. Hearing Voices, for instance, is (in some ways, I believe) a more grassroots version of OD. So that’s available. With minimal training you can get going with that. I would like to add that much of the value of the inspiration Open Dialogue provides is not about what can happen if you DO Open Dialogue per se; it’s the value that can come from starting from its basic principles. Sometimes that’s all it takes; knowing that a different path is possible. This comes with some challenges, however; understanding that our mental health is intertwined with others’ means that we can offer to be a part of helping with theirs, but we also have to accept that we may have been a part of their struggle and suffering as well. I’m speaking, of course, about family. Basically; be careful what you wish for; Open Dialogue means that a conversation about a family member’s mental health can (and ideally should) become a conversation about our own.